That there is a wholesale shop for synthetic fabrics, printed, brocade .. that sort of thing. Generally, I go for natural fabrics- cotton ,silk ,crepe.. But ,This time I decided to buy a few pieces. 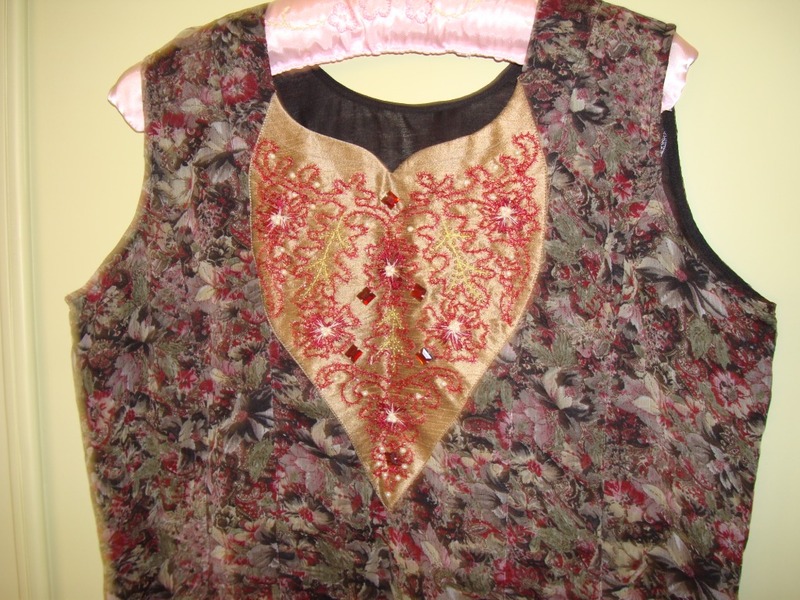 The yoke for this was made in antique gold colour fabric[which was also from the same shop]. Pattern- the pattern is adapted from one of the antique patterns here. Thread- couching was done on dark red rimjim thread. Though the fabric may not be ideal for summers here and Chennai, it has easy maintenance [just throw it into the machine and there is no colour running, great relief!]. There is lining for this tunic too.thus it doesn’t irritate the skin too.